This topic contains 12 replies, has 6 voices, and was last updated by anonymous 3 weeks, 5 days ago. Does anyone know the company that currently makes and supports Glarysoft? I have tried to verify who and where they are located but without any meaningful success. The product is good, and does what some reviewers claim it does, but their base of operation and technical/customer support staff is a real mystery. Is it England, China, USA or ?? Are you concerned about their use of users data, is that why you ask this question? I can only find where site is, have you tried directly asking Glarysoft that question? I like to know who supplies and supports software that I use it, especially if I purchase a license via credit card. Glary is the first software company that I have considered using that is secretive about their company, location and technical support capabilities. For me that is a red flag. As much as I like the product, I chose not to use them. That’s why I asked the forum. Am I paranoid? I have used it for a while its a really handy little utility but has updates almost weekly which is a pain and seem to bring no useful discernible improvements so I usually remove the start up task and remove the Task Scheduler Task to get round all the persistant nags to update. Would be nice to know more about the company though they have seemed to fly under the radar for the most part. Took me quite a bit of Googling to find the above address. Ah, another thought after finding this Reason Labs link. 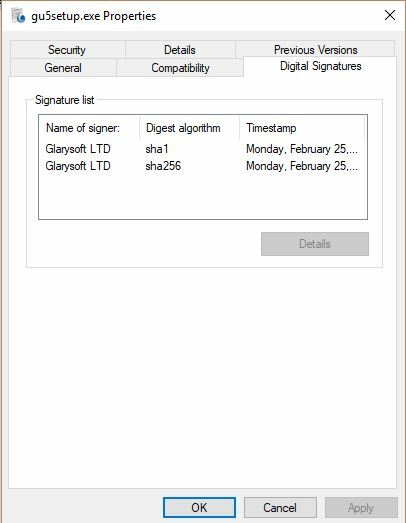 Have you personally checked an Glarysoft executable file’s properties dialog for a Digital Signature tab? I just started using it about 3 weeks ago but if it’s Chinese, I may reconsider. You have to pick one and click details to read the rest of it. Does anyone know the company that currently makes and supports Glarysoft? I have tried to verify who and where they are located but without any meaningful success. The product is good, and does what some reviewers claim it does, but their base of operation and technical/customer support staff is a real mystery. Is it England, China, USA or ?? GOVERNING LAW AND DISPUTE RESOLUTION: These terms and conditions hereof will be governed by the laws of the People’s Republic of China. Thanks for the info, I guess that I will be getting rid of Glary although I like it as an alternative to CCleaner which has Ad pop-ups now that they were bought out. I guess I will be stuck with CCleaner as a cleaning tool. @cadesertrat why not give bleachbit a whirl? No background stuff (IP phone home/ads) other than your permission to update the winapp2.ini file which can be switched off, it’s clean and does a mighty fine job in my experience on linux and windows. Thanks for the suggestion but that looks like a whole new learning curve as to how to clean things “Safely” without eliminating things that are needed. Thanks for the link and I will have to study it further, as the last thing I want to do is have it take out something that I actually need on the computer. The only thing CCleaner is good about is the simple interface and it is pretty safe to use as far as the easy selections for deletion. It is similar to CCleaner, you can secure erase or simply delete all data created by picking a program or select the specific type data.